The Chipper Clipper: FREE BOWLING TOMORROW 8/7 ONLY!!! Saturday, August 7, 2010 is National Bowling Day! Over 3,200 bowling centers around the nation are participating in National Bowling Day and are offering FREE games of bowling. Head here to find participating bowling centers in your area and sign up for your free game of bowling coupons. Each player should print a separate coupon. 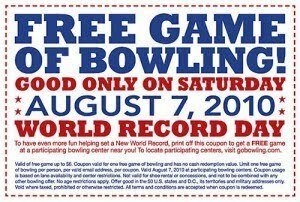 The coupon has a value of $6, so at bowling centers where the cost of a game is more than $6, a discount will be applied to the total.